Nye was the fastest growing rural county in the West from 1980 to 2015, a recent study found. 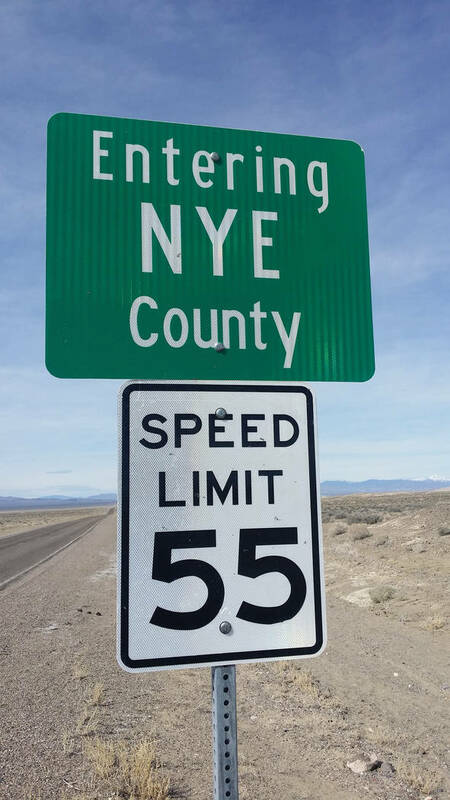 David Jacobs/Pahrump Valley Times A sign welcomes motorists to rural Nye County as shown in this photo. Kelly Pohl, research and policy analyst at Headwater Economics and co-author of the study said that Nye County’s total population grew the fastest of all rural counties in the west in the 35-year period. A study of western rural counties with a population of less than 50,000 people that was conducted by Headwaters Economics, a nonprofit research group in Bozeman, Montana, found that the growth in Nye County was contributed by all demographic groups. Kelly Pohl, research and policy analyst at Headwater Economics and co-author of the study, said that Nye County’s total population grew the fastest of all rural counties in the West in the 35-year period. “Hispanics are the fastest growing group in Nye County, but the growth is happening across all of the demographics,” Pohl said. Between 1980 and 2015, Nye County population has grown from 9,048 to 42,625 people. The population increased by 5,537 Hispanic residents, 5,477 non-white residents, and 2,708 foreign-born residents in the 35-year period. “With the caveat that we didn’t do a specific analysis on Nye County, it looks like retirees age 65 and over is the fastest growing group in Nye County in the the last five years,” Pohl said. Lyon County, Nevada; Eagle County, Colorado; Summit County, Utah; and Teton County, Idaho were also on the list of the fastest-growing counties in the U.S. In all five counties, minorities are now a much larger share of the total population than they were in 1980, according to the report. Nye and Lyon counties in Nevada have grown, partially because of their proximity to large metropolitan areas of Las Vegas and Reno, the report said. Ninety-five percent of rural western counties experienced growth in Hispanic populations from 1980 to 2015, and 99 percent of rural western counties in the West had an increase in minorities in the same time period. The report said that Hispanics represent the fastest-growing demographic in the U.S. in both metro and rural counties, fueled by both natural births and immigration. In 89 percent of rural western counties, people of color have also increased since 1980, but the pace of growth has been slower than Hispanic or foreign-born populations, the study found. Rural western counties with the most growth in people of color generally are on and near Indian reservations or faster-growing counties near metropolitan regions. Foreign-born populations also increased across much of the rural western counties, growing in 80 percent. The “foreign born” category includes anyone who is not a U.S. citizen at birth such as naturalized U.S. citizens, lawful permanent residents, temporary migrants, humanitarian migrants, and unauthorized migrants. On the other hand, Eureka County in Nevada was one of the four western rural counties where the total population increased but the minorities population decreased. Eureka County, a mining community in central Nevada, historically had a small minority population that has shrunk in recent years, despite growing economic opportunities, the report found. Between 1980 and 2015, the number of mining jobs in the county increased 11-fold, from 364 to 3,993, the data showed. During the same time period, the number of non-white residents decreased from 85 to 70 while total population increased from 1,198 to 1,987. Although these changes in minority population do not indicate a dramatic exodus, the report said they suggest that the mining boom failed to attract new minority residents. While Nye County is growing across all demographic groups, populations in many other counties would be declining if it wasn’t for minorities, Pohl said. “That’s true for Nye County’s neighbor, Mineral County, where the total population decreased, but minority population increased,” Pohl said. A common misperception holds that rural communities mostly consist of non-Hispanic whites of European descent, contradicting the history of racial and ethnic makeup of the rural West, the report said. Meanwhile, the current demographic trends in rural western counties have a strong impact on agriculture, civic engagement, economic development to politics, schools and labor force. Pohl said rural counties in the West are important for producing food, water, energy and natural resources, which sustain the national economy. In addition, she said voters have “significant” political power in rural counties. Since minority populations tend to be younger than non-Hispanic white populations, their growth across the rural West helps to keep open school districts and spur job growth, the report found. While population and jobs increasingly are concentrated in urban areas, growth in minority populations is a major factor in sustaining and growing the population in many rural western counties. “Whereas there’s (population) growth, there are jobs, and people move to those areas,” Pohl said. The report also highlighted the challenges associated with the recent demographic changes. One of them is a lack of preparedness for an influx of culturally distinct newcomers, as some counties may not be ready to embrace a changing demographic balance. In addition, there may be an uneven incorporation of ethnic and racial diversity into politics, economies, and educational systems in the rural West. As generational divides and political polarization grow across the rural West and the nation, the study said the increasing diversity of many communities will require finding commonalities across race and ethnicity.